Looking to grill up some meat that’s not beef, chicken or seafood? Have you tried grilling lamb before? It’s absolutely delicious and it requires minimal preparation! I often hear from people they just don’t know if they’ll like the flavor of lamb, but it all depends on the cut of meat you use. This easy recipe for lamb kabobs uses lamb shoulder, which is the ideal cut for grilling. I like to cut the meat into larger chunks; the larger pieces will stay more juicy and there’s less risk of over cooking, which results in dry meat. The tender, juicy cuts of lamb leg are marinated in garlic, olive oil and fresh herbs! If you have time, get the meat marinating the night before; the longer the meat can marinate, the better! I also like to add a bit of bell pepper and onion to the kabobs for flavor and variety. Feel free to add your favorite grilling veggies to the mix! These lamb kabobs would not be complete without a dipping a sauce. My easy chimichurri sauce is the bomb! You’ll want this sauce with everything once you try it! It’s super refreshing, zesty, spicy and the perfect dip and sauce for lamb. 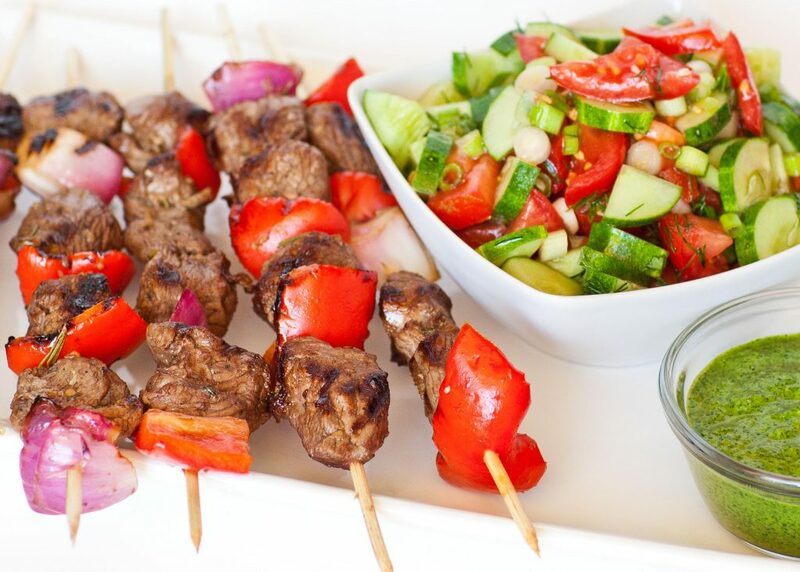 Since lamb meat can be a bit heavy, I also serve the kabobs with a simple side salad of tomatoes, cucumbers, dill, green onions and olive oil. Just writing this recipe post is already making me hungry! Get all the details by watching my video recipe! Prepare the lamb meat: cut away all fat and ligaments from the meat; discard the bone. Cut red meat into 1 1/2-inch pieces; place into a large bowl. Add all the marinade ingredients: thyme, rosemary, garlic, lemon juice, vinegar, olive oil, salt and pepper. Add chopped red onion and pepper; use a spatula to coat meat and vegetables in marinade. Cover bowl and refrigerate for a few hours or overnight. While meat is marinating, prepare chimichurri sauce. Place all ingredients into a food processor or blender and mix for several minutes until thick sauce forms. Refrigerate until ready to serve. For salad, simply toss together cucumber, tomatoes, scallion and dill with salt and olive oil. 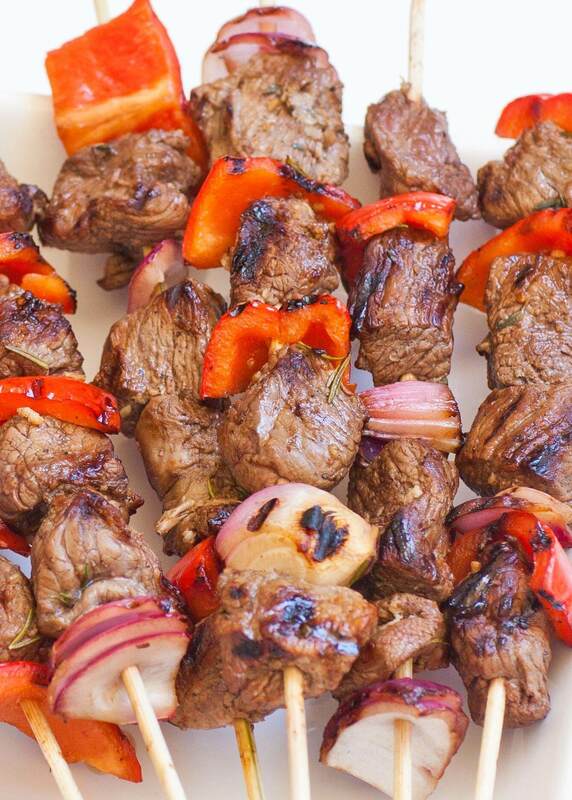 Once meat has marinated, skewer meat onto wooden or metal kabob sticks. If using wooden sticks, make sure to presoak them in water. Alternate adding the meat with onion and pepper slices. Do not overcrowd the kabob; allow room for the meat to cook! Preheat an outdoor grill to 450F or a grill pan over medium heat. Place kabobs onto hot grill, turn every 5 minutes until cooked through, about 18-20 minutes. Let the meat rest for about 5 minutes before serving with salad, chimichurri sauce and/or rice.